Meet The Dem Running Against Indicted GOP Rep - Joe.My.God. GOP Rep. Duncan Hunter’s indictment is likely to shake up the race for his southern California seat, even though his district is traditionally Republican. Hunter was indicted Tuesday for misusing campaign funds, which has some Democrats optimistic the seat his seat is in play. 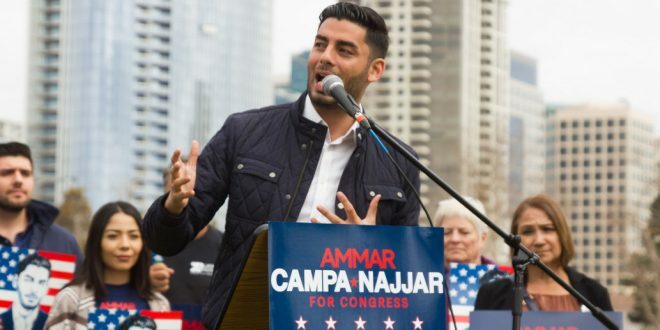 Mr. Hunter easily won California’s nonpartisan primary with 48 percent of the vote; the next highest vote-getter, Ammar Campa-Najjar, a Democrat, took only 17 percent. Despite that, Democrats have long thought they could make a play for Mr. Hunter’s seat, especially if he were indicted. At the very least, the indictment will require Republicans to either spend money to defend the seat. Campa-Najjar has been out-fundraising Hunter, with more than $1 million in campaign donations. He has just over $200,000 in cash-on-hand. Hunter has over $350,000. A former Obama’s aide, US Hispanic Chamber of Commerce and Department of Labor employee, Campa-Najjar — whose parents are Mexican and Middle Eastern — supports fixing Obamacare and working toward Medicare-for-all, passing a clean DREAM act and is part of a growing cohort of candidates who is not taking any corporate or PAC donations. “Today’s indictment confirms just how deep this corruption can reach when someone like Duncan Hunter Jr. is in it for himself instead of representing the people,” the Democratic candidate said in a statement light of Hunter’s indictment. No days off until Election Day! 80 days until the weekend. The division, chaos & corruption in DC has gone too far.